I’m not a big fan of traditional meatloaf, but I thought I’d give it a try, substituting homemade apple chutney for the traditional ketchup or tomato sauce. I like how it turned out, even though the apple flavor is barely detectable. It’s flavorful and rich, with just the right amount of spice. In future batches, I’d like to try adding chopped cranberries. I’ve had buffalo pemmican with cranberries that was really delicious, so why not have them in meatloaf? 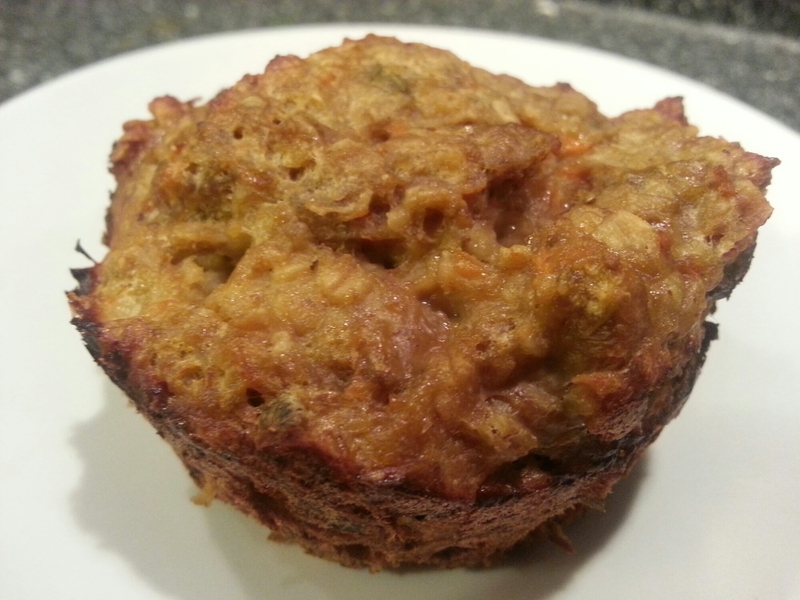 Baking the meatloaf in muffin tins takes less time and makes it easier to freeze single servings for later. Sauté carrots and onion in a small amount of oil until slightly softened and onions begin to look clear. Let cool. Stir all ingredients by hand until just mixed. Fill muffin tins. Do not pack down the meat as you go, or the meatloaf will end up dense. Cover with foil. Bake at 350 degrees for 30-35 minutes for muffins, removing foil 10 to 15 minutes before meat should be done. Meat is ready when thermometer inserted into center of muffin or center of loaf reads 160 degrees Fahrenheit. Cool on rack for 10 to 15 minutes before removing from muffin cups. Serve with Greek green beans or seasonal vegetables.